Biden’s plea to techies, at times emotional when he spoke of his son Beau’s battle with cancer, was blunt about the challenges that impede cancer research. Scientists, oncologists, radiologists, immunologists, and all of the hospitals and research institutions that study the prevention, diagnosis, and treatment of cancer are only just now beginning to share their data with one another. “You might think at a time when Facebook has an algorithm to tell if someone is exhibiting potentially suicidal tendencies, that medical centers might be able to detect if someone has a risk for cancer,“ Biden said. ”But they can’t." Electronic medical records have moved data from paper to the cloud, but if hospitals are using different systems, there’s no way for a patient’s doctors at those hospitals to send health records to each other. Biden experienced that firsthand with his son’s cancer treatment: Beau Biden’s doctors used their cell phones to take photos of his CAT scans and send them to each other. “That’s not a cancer problem,” Biden said. It’s a technology one. The Biden Foundation’s Cancer Initiative has already made strides in bringing various stakeholders to the table to work together. As part of the Moonshot’s work, the National Cancer Institute and the University of Chicago last year launched the Genonic Data Commons, a platform for collecting and storing more than 30,000 cancer patients’ genomic datasets. Biden said Amazon called to offer up free cloud storage for all that data. The initiative also launched a tool where you can see every cancer trial in the U.S. and the criteria for the trial, in the hopes that more people will enroll in trials and more information can be collected. The only bipartisan thing left in America is the fight against cancer. The bulk of money for cancer research comes from the federal government, and Biden is hopeful that will continue with Donald Trump in the White House and a Republican-controlled Congress. He vowed to work with Trump to ensure cancer research remains a top priority. 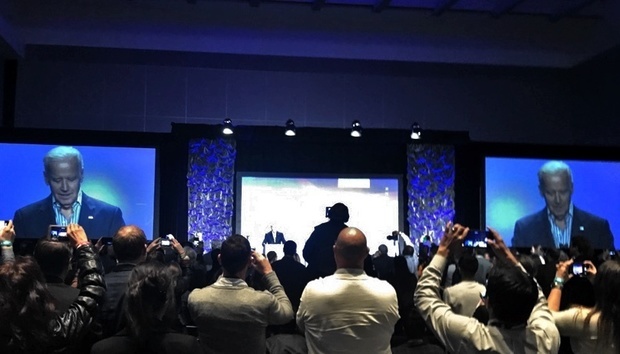 When Biden’s appearance at SXSW was announced just prior to the festival’s kickoff, people wondered why he wanted to talk about cancer to a ballroom full of entrepreneurs, investors, and creatives. Biden had a clear answer.